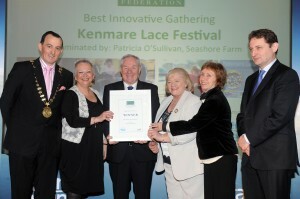 The first Kenmare Biennial Lace Festival was held from October 3rd to 6th 2013. It was an amazing event and a tremendous success, as was recognised when the festival won the national award of ‘Best Innovative Gathering award’. This was followed by two days by events including lace workshops in five different disciplines of lacemaking and competitions, whose entries came from Australia, Great Britain, Italy and Ireland, including many entries from the textile students in our Irish Art colleges. There were three exhibitions of lace, a lace library in Tom Creans and ‘social tables’ where people sat at tables in Jam, Cupan Tae and The Brooklane Hotel, working on their lace and other handwork and were joined by complete strangers. At the gala dinner our speaker Veronica Rowe spoke of Limerick Lace and her family connection with it. The superb fashion show, a testament to the hard work of Lynn Brennan and Irene Carey is to be repeated in April as a fundraiser. At the closing luncheon at the Sheen Falls Lodge one of the pieces of artwork donated by artist Christine Bowen was raffled as a fundraiser and prizewinning lace artist Fiona Harrington gave us an insight into her journey through art to lace. None of this could have happened without hardworking committee of Siobhan Thoma, Anne Dunne, Emer Finnegan, Cathrine Gibbons, Lynn Brennan and Nora Finnegan. A fundraising Quiz night will be held in the Brooklane Hotel on Sunday March 23rd at 8pm. All welcome.